To survive the night, cops and criminals alike will have to unite and fight. A classic head-to-head showdown ignites in an all-new update of the 1976 action thriller of the same name. With only a few hours left in the calendar year, Precinct 13, one of Detroit's oldest precinct houses, is closing. Amid heavy snowfall and unsafe road conditions, only a few lawmen remain on duty for New Year's Eve. They are headed by Sergeant Jake Roenick (Ethan Hawke), a good cop wrestling with bad memories of a fatal undercover op from the previous spring. 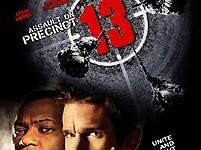 Roenick and Precinct 13 have both seen better days. Early on December 31st, deep in the city, formidable crime lord Marion Bishop (Laurence Fishburne), is cornered by an undercover cop. Their ensuing struggle leaves the cop dead - and Bishop captured, by the Organized Crime and Racketeering squad that Marcus Duvall (Gabriel Byrne) runs. Bishop is handcuffed and herded onto a prison bus with several criminals: junkie Beck (John Leguizamo), hustler Smiley (Ja Rule), and gang member Anna (Aisha Hinds). But the battering snowstorm stops the bus well short of its high-security destination and strands it at the remote Precinct 13 - where, as night falls, the prisoners are temporarily incarcerated. This influx of prisoners irks Roenick, almost as much as visiting police psychologist Alex Sabian (Maria Bello) does. But Precinct 13's provocative secretary Iris Ferri (Drea de Matteo) and salty veteran cop Jasper "Old School" O'Shea (Brian Dennehy) won't let the increasing workload deter them from celebrating...until two masked gunmen break in and attack the guards from the bus. 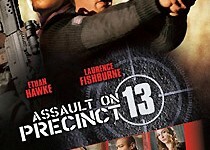 The gunmen are just barely beaten back, and everyone inside Precinct 13 realizes that more will come - to extract crime lord Bishop, but also armed and ready to shoot anyone and everyone else. The cops, looking to the reluctant Roenick for leadership, and the cons, looking to the steely Bishop for an angle, must join forces to live. Fortifying themselves with minimal weaponry and maximum courage, they will not go gently into the bad night. As they fight to the death, the thin lines between good and bad bleed together.